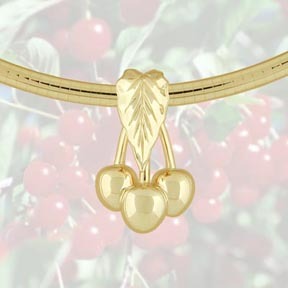 This delightful cherry cluster pendant will help to remind you of your Door County visit. Clean, elegant lines highlight this and many other original pendants and rings designed and crafted by artist Karl Stubenvoll. A 100+ year old schoolhouse and (later) church makes a warm and inviting working studio. Gallery of Gold is located next to the post office on Hwy 42 in Fish Creek. Call toll-free 800-334-2765.